There are few places Yacine, 13, likes to be. Not his school on the outskirts of Casablanca, where he says his teacher comes to class drunk. Not his crumbling home in the city’s sprawling slums, where his mother hit him with an ax. In a country where drug abuse, delinquency and extremism have compelled government officials to embark on what has been hailed as one of the Arab world’s most aggressive programs of slum eradication, the center is trying to lure marginalized children away from the troubled paths so often followed by those living in squalor. The center is run by Idmaj, Arabic for “integration,” an association of youths who come from the impoverished neighborhoods they are serving. Mr. Mazoz believes that no one understands the needs of these youths more than their peers and that the children can lead by example. The center has several classrooms, computers, an extensive library and a stage. Students join sports activities, learn French or English, attend conferences or gather to debate the issues they face. They recently began a journalism project, Words for Change, in which the children blog about their lives. Bolstering self-esteem has been a goal of Mr. Mazoz and Idmaj. Where social advancement is made difficult for many because of the stigmatization and discrimination faced for being born in these parts, the center has empowered many. “Before I was ashamed to say I was from Sidi Moumen, but now I am proud,” said Abdssamad Nifkiran, as he showed off a Sidi Moumen Cultural Center T-shirt that he said he wore around town. Parents see Mr. Mazoz as a savior. Others say the center is an escape from the hardships of everyday life. “The kids have nothing to do and nowhere to go, they just hang around,” said Hassna Fatoumi, another mother, whose three children come to the center. Many of the children endure horrid living conditions. Heaps of rotting garbage swelter in the heat and hundreds of people cram into makeshift rooms that serve as living quarters, sleeping quarters and kitchens rolled into one. Often there is no running water, no electricity and no windows for fresh air or light. Bathrooms are rare. Poverty has led to high levels of school dropouts, illiteracy, drug use, delinquency and worse. Every one of the 12 suicide bombers who strapped explosives to their chests in central Casablanca in 2003 were products of the Sidi Moumen slums. That was the deadliest attack on Morocco to date. Those who detonated themselves in the city in 2007 also came from those slums. 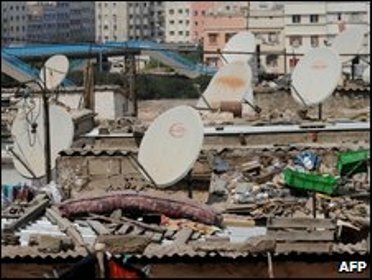 In 2001, aware of the problems growing within the slums, King Mohammed VI made poverty eradication a priority, calling for a supreme jihad to eradicate the social conditions that had created the shantytowns. Then, after the attacks of 2003, he introduced “Cities Without Slums,” a program aiming to eliminate all slums from the country by 2012. The program offers land to developers at cut-rate prices if they sell some floors of the apartments to families from the slums below market price. Loans are made easier and the families receive grants to help them pay. For a country with limited financial resources, the program has become a success story for the government. “It’s not easy, we’ve chosen a difficult problem,” he said. But Mr. Hejira said Morocco was on track to meet its goal of a slum-free country by 2012 if all partners in the program continued to work together. Driving through these neighborhoods, change is visible. New buildings are springing up. Children play on fields awaiting construction where slums have been cleared. During the past decade, Morocco has decreased poverty drastically and the slums are shrinking. “As of May 2011, 43 cities have been declared Cities Without Slums,” said Fatna Chihab, director of social housing at the Housing and Urban Planning Ministry. Still, some in extreme poverty say the housing is still out of reach. “The program works, I’ve seen many leave. But I don’t have the money and can’t afford the loans,” said Fatna Helam, a single mother whose husband died in an accident while working in Libya, leaving her to raise her daughter alone. Her home, a two-square-meter, or 22-square-foot, room in Casablanca’s Al Menzah slums, is shared with her one daughter. Mrs. Chihab, however, says such cases are the exception. “There are some cases of people in extreme poverty and we must try and find adapted solutions for them,” she said. Still, some say the new housing units are becoming cement ghettos because families with limited finances have to go in on apartments together, cramming many into a small space. “It’s just creating new slums,” Mr. Mazoz said. For those who wait, the Sidi Moumen Cultural Center and its youth volunteers will continue to reach out to children like Yacine, who Mr. Mazoz recently took to a psychiatrist. He also found the boy a new living situation. “The mother came back two days ago with a big knife and started beating him, but the members of Idmaj were there to save the kid and call the police,” Mr. Mazoz said. On a recent Sunday, parents gathered, music blared and a group of Sidi Moumen children took to the stage to present a play entitled “There Is Always Hope.” Mr. Mazoz stood up to thank the volunteers and encourage the children to continue. Before he could speak, the youths erupted in cheers and chants. “Father Mazoz, you love us and we love you!” they shouted, as Mr. Mazoz smiled.